I believe that a lot of people are afraid or atleast disgusted by these resillient insects. My girl would stop frozen in the bathroom when she sees one, she would even allow herself to be late rather than cross the path of a creepy crawly like that. I could recall when she slept over at my house that when she used the bathroom after we made some smoochy smoochy that she wailed a blood curdling scream when she saw a cockroach in the sink. I myself am disgusted of them but not frightened, I was even the one who picked the poor creature out of the sink just to calm down my girl. How about you are you afraid of La Cookaracha? During my school days I have done dissection of many cockroaches, hence I am not scared of that wonder insect, which has white blood, and will not die even if the elephant stamps it at once ( they will die only if we invert them and stamp), they can pass through the hole smaller than their body, if their antennae enters the hole. I am not afraid of cockroach and if i see them i will kill them. They are dirty and needs to be vanish. I dont think that would be possible for now happy mom cockroaches have been here on earth for thousands of years they have out lived the dinosaurs and even creatures older than the dinosaurs and they can even survive a nuclear explosion. They say when man is extinct cockroaches will still live on....I just hope that I can keep the house clean so that I wont attract them. hahaha.. cockroaches! no, i'm not afraid but my husband.. he really is afraid of this disgusting creature..that is why i always make laugh of him. yeah that is a funny story he is the first grown straight man that i heard that is afraid of La KooKaracha haha...any ways I keep them out of the house by making sure there are no food scraps left on the table but on an average there are hundreds or even thousands even in a well kept house. As long as I dont find one crawling over something I will eat Im pretty much ok.
My friends are afraid of cockroaches. Whenever they see one, they would scream. I'm not afraid when the cockroach is just crawling on the floor. I just step on it and kill it. I am afraid if the cockroach flies. It might land in my face so I try to move as far as possible. The reason flying cocroaches are dangerous is they might accidentally hit your eyes, imagine cocroaches when the crawl on a patch of skin when you are asleep will surely turn into a rash, that's already resistant skin we are talking about let alone sensitive skin of your eye imagine what damage their germs and their sharp tiny spines can do to your eyes. no i'm not afraid of la cockroacha hehehe loved the use here i don't scream blood curdling but i'm definitely disgusted like u when they are around and i think where and why my house is dirty but till date i have found they are intruders ,my house is clean. I used to be very afraid of them. When I was younger we lived in a part of my country that had super huge ones (we called them tree roaches) and I can remember having nightmares aobut them. I was picking an item up off of a counter one day and grabbed one of these large creatures in my hand. It scurried up my arm a bit throwing me into hysterics and leaving me terrified of them for quite some time. Thankfully, the area I live in now has very few of them and the ones we have are not the large variety. It has been years now since the incident and I think I am over my fear..... at least it is not as bad as it once was. I am not so afraid of the cockraoches, as long as they won't fly. In the past it's common to see large cockroaches. Now it's different. There will be more little cockroaches and people say they are from Germany. These little cockroaches are much more disgusting. They grow much more than the big ones. And they go everywhere, they even go into the computer. Lately I have an effective medicine and it seems they were all killed. I am very pleased to it. yes!! yes!! i am afraid of roaches!!! Actually I'm not afraid of cockroaches but when I saw those crawling, flying, in the ceiling I must do something to kill them. Coz we all know they carry diseases and germs that can gives us sick. I always have a insect spray or chalk to prevent these kind of dirty insects. I am not afraid of cockroaches. There are many cockroaches in my house. But i feel irritated, when i see many cockroaches. 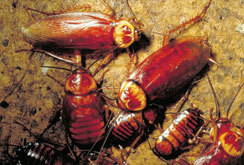 We use cockroach killer at regular intervals to control the number of cockroaches. Filthy horrible creatures... For what purpose were they placed on earth? I mean most creations are here for a reason, which one belongs to the roach? I hate them, not afraid, just hate. Roaches are just disgusting and I could not imagine living with them in my home and don't understand how people have no problem living with them. People can control roach infestation and should. They are germ infested and bring lots of health problems. People with asthma are allergic to the droppings of roaches. Why live with the nasty things? Thanks for the discussion, I am sure that lots of people will find remedies through your responses...Combat works! I loathe cockroaches. And yes, I am deathly afraid of them. Luckily I have never seen one in my home, otherwise I would seriously freak out. Hope my kids would help me out and take care of it, becuase I wouldnt be able to rest easy until it was gone..eww ewww ewwwww. That picture you have even freaks me out.